Is it Time to Start Worrying About Heartworm? The risk of heartworm disease is not one to take lightly. Heartworms can be life threatening and dangerous to treat. Historically, heartworm disease in Portland has been uncommon, with more cases occurring in southern Oregon and other parts of the country. At this point, the actual risk of exposure to heartworm for a dog living in Portland year round is still uncertain. According to the Companion Animal Parasite Council, the prevalence rate of canine heartworm disease in Multnomah County is 0.32% (as of March, 2019). Since this data does not include the travel history of the dogs that tested postive, this likely includes rescued dogs that are brought into Portland from parts of the country with very high heartworm rates, like Texas. Climate is likely one of the factors contributing to the difference in heartworm infections between Portland and places like southern Oregon. Unfortunately, it seems our climate is becoming less predictable and the future risk of exposure is likewise less predictable. Eventually, heartworm disease may become a threat during the warm summer months, and it’s possible that there may already be a risk. Therefore, using a heartworm preventative during these months is something to seriously consider. If you are traveling with your dog outside of Portland to a heartworm endemic area, we recommend using a heartworm preventative. The website petsandparasites.org is a handy resource to check your destination for heartworm prevalence. If any doubt, err on the side of prevention. Confirming a negative heartworm test is essential before starting a heartworm preventative. 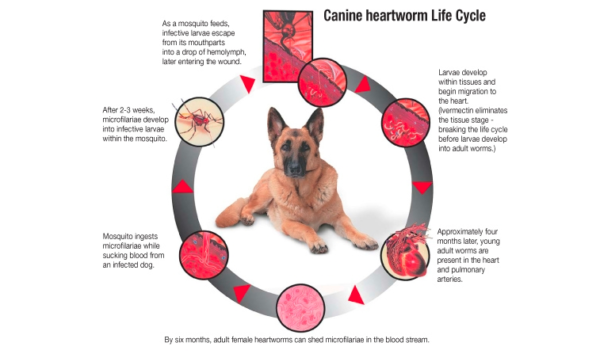 Adult heartworms begin as larvae that are transmitted when a mosquito feeds on an infected dog, and then goes on to bite another dog. After 6 months, the larvae become adult worms, which produce the antigen that we can detect with a standard heartworm test. This means that the test won’t detect the presence of heartworm until an adult worm is present, which may take as long as 6 months after exposure. Infection is unlikely after the warmer months of summer and fall, so we typically recommend waiting 6 months past October to test Portland dogs. Dogs who have traveled to or have been adopted from parts of the country that maintain a warm climate throughout the year (Florida, Texas, Hawaii, etc.) require a different testing schedule as determined by a veterianarian. We would be happy to schedule a heartworm test or wellness exam for your dog – just give us a call!